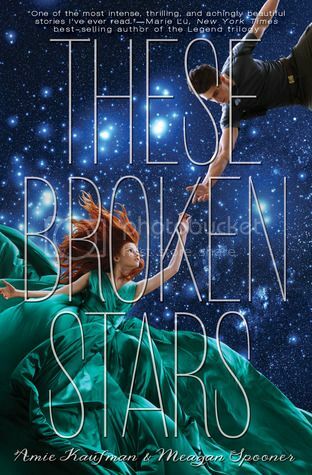 I was super excited to start reading These Broken Stars after reading so many raving comments about the book. Having now read it, I definitely recommend everyone adding this book to their to-read list as soon as possible. You definitely won’t be disappointed with this read! The story is told through the viewpoints of the two main characters, Lilac and Tarver. I really love reading books with different viewpoints, because I always feel that the reader gets so much more information this way. Lilac is the daughter of the richest man in the universe, and Tarver is a young war hero, so of course the two have absolutely nothing in common. But when tragedy strikes, they are forced to rely on each other to survive. There is absolutely no way that they could have survived by themselves, so being thrown together was definitely a blessing for them, and they made it work the best way they possibly could. For two people that started off completely hating each other, it was interesting to see their relationship change over the course of the book. The storyline for the book was of the dystopian / sci-fi genre, which I found to be absolutely fascinating. The world-building for the book was so wonderfully detailed as well. Without giving much away, let me say that this book is an adventure that you won’t soon forget. It will definitely make you think, and wonder, not only about the characters and their mindset, but also their surroundings as well. The romance in the book will definitely make you swoon, and there is one part in the book that will leave you gasping, wondering what in the world just happened! There was never a dull moment in this book. I also want to add that I LOVE the cover art for the book. Whoever designed it did a wonderful job; it is absolutely stunning and it is perfectly suited for the book as well. Overall; I could keep going on and on about this book, but I won’t. Add it to your to-read list. Pre-Order it. Do whatever you have to do to READ THIS BOOK. It will definitely be worth it! I can’t wait to read the rest of the books in the series when they are released! Great review! I am so glad you enjoyed this one as well. It ended up being one of my favorite books of the year! Like you, I especially loved the setting. So fascinating! I'm glad to hear that this book lives up to the hype! I have a copy that I hope to read soon. I'll have to move it up the TBR pile. I agree about the cover too. Thanks for sharing your review! Oh my god, what IS it with this book???? It seems like everyone is utterly and completely in love with that!!! I have read reviews from people who have completely opposite tastes and it seems like they all find it amazing!! I really need to go get this one soon!